There are many countertop materials out there, but which one is right for your needs? The right countertops strike the balance between functionality and aesthetics. With all of the options out there, it’s no wonder that fads come and go and some materials are trending particularly during 2019. It also depends on your needs because a household with children may need a more durable and easy-to-maintain a countertop or you may have certain cost requirements when it comes to your kitchen or bathroom remodel. Either way, it’s important to take a look at some of the options out there and narrow down the list. Below are some trending countertop materials worth taking a look at. Starting off a list of trends with such a classic like granite countertops may seem counterintuitive, but the truth is, it’s a quality material that has staying power for a reason. Not only is it durable and low-maintenance, but it carries natural beauty that is completely unique. Because it’s a natural product, no two granite countertops are the same so you are guaranteed something completely unique that will surely make your kitchen or bathroom remodel shine. Glass counters typically aren’t used exclusively, but they can make for a one-of-a-kind look in some places. For example, having a glass countertop on your kitchen island can add an accent that is far from traditional. Some are even back-painting their glass counters to offer a spark of color as well as inserting media devices beneath a glass so you can quickly access smart tech. Many people are chasing after nostalgia for another time, which can often involve incorporating elements of rustic and traditional homes into newer built ones. 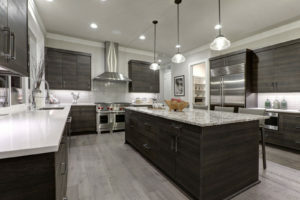 This includes a booming love of reclaimed wood, which can make for a great contrast to an otherwise drab kitchen, especially if you opt for all-white cabinets which can go perfectly with deep, rich brown counters made of wood. Concrete can come in a number of colors and even be formed into different shapes to fit whatever your specific needs are. Because it’s such a customizable material, it has been used in more applications than ever. Some people have gone so far as to embed other materials, like glass or artwork, into concrete to make the counter a functional piece of art. To get in touch with us, give us a call at our office at 302-663-0464, send us an email at info@accessiblehomebuilders.com or visit us in person at 28412 DuPont Blvd, #103 Millsboro, DE 19966. Alternatively, give our satellite office a call at 302-628-9571 which is located at 500 W. Stein Hwy. Seaford, DE 19973. Be sure to follow us on Facebook, Twitter, LinkedIn, and YouTube to stay updated on what we’re up to! This entry was posted on Friday, April 12th, 2019 at 11:49 am. Both comments and pings are currently closed.